So, I was on Twitter and then I saw one of my followings retweeted Evernote Latam Account. Since I am an Evernote fan I went to follow them. First of all, I have to recognize that if it was not pre-installed on my laptop, I would never ever have known Evernote. Thank God I did. I write there all of my ideas and possible future posts of my other blogs. Suddenly, Evernote Latam Account asked what do we use it for. I told them what I told you. 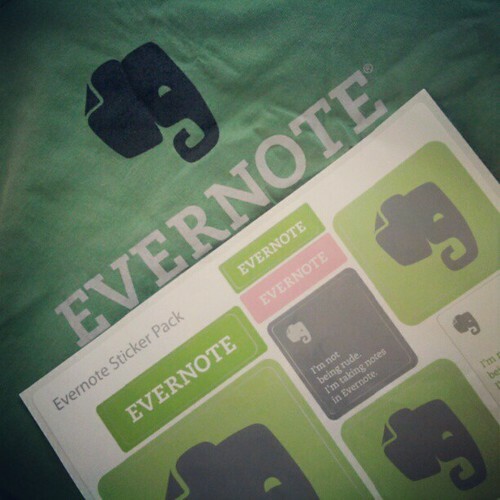 Next day, they told me I have won a surprise package from Evernote. I could not believe it but I was all excited. Finally, yesterday arrived my surprise package and it contained a t-shirt and stickers. Unfortunately, stickers did not arrive perfect. They arrived with wrinkles and stuff but I hope they flat when I use them. So, today was the day and I try my new Evernote T-Shirt. What do you think? I really like it! It fits so well and it is a really light one! Previous Post El fin del mundo está cerca. ¡Arrepiéntanse, expertos de las redes sociales!